Winner Update: Cash Is Chaos, you are the winner. I have sent you an email. 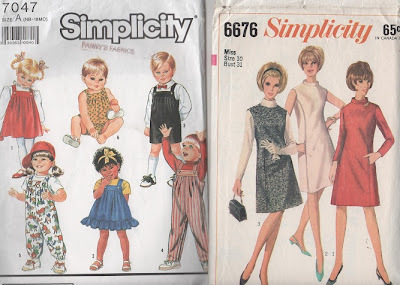 The marvelous thing about sewing with vintage patterns is you can make almost any out-of-date thing look new again with the right fabric choice. And you're pretty much guaranteed to have a one-of-a-kind look! 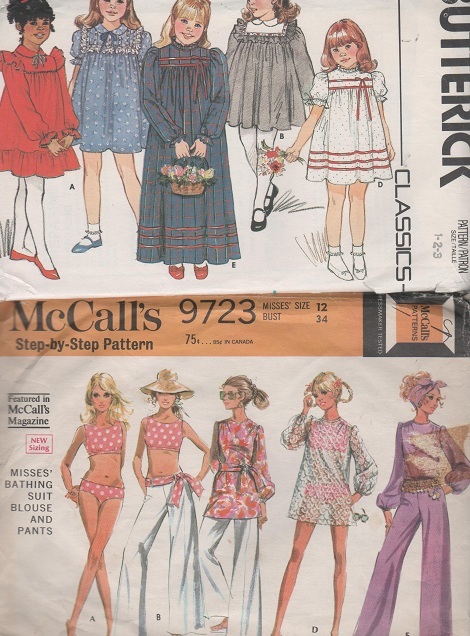 I am giving away a vintage pattern from my stash. 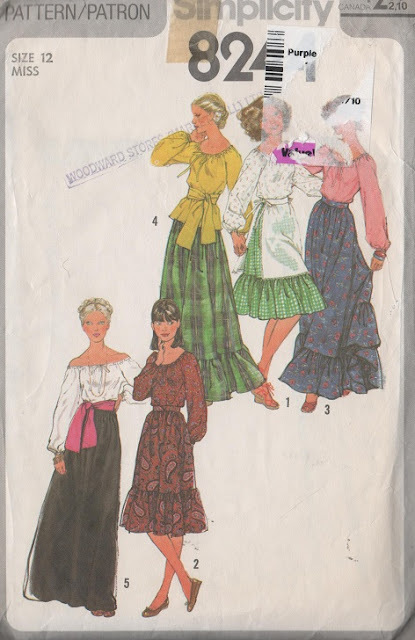 I have a collection of women's and girls' patterns in various sizes. I will email the winner and find out what size you would like to receive. The pattern will have to be a surprise. To enter the giveaway, leave a comment below telling me of a vintage style you like, or one that cracks you up (hello, huge pointed collars?!) I will choose a winner via Random.org on March 20th. I am loving the bathing suit/I dream of Jeannie outfit - delightful and hilarious! I must learn the art of wrapping fabric prettily around my head if I win...or invest in big floppy hats. Thanks for the chance! One that cracks me up is the jumpsuit for women. What cracks me up even more is that it is coming back! SMOCKING!!!! I will learn to hand smock before I die! Vintage aprons! All the ric-rac and buttons and silly, little embroidered and stitched details. They are so sweet and I sometimes dream of the women (and men!) that wore them around their home. Were they trying new recipes? Were they frantically cleaning before guests arrived? Were they interrupted by the phone? :) heehee. I really love that first one! For those of you that think they are bathing suits, they are actually body suits. I am old enough that I remember wearing all of these styles. Frankly, I hated the body suit since it made going to the washroom a real chore! However, the purpose was to keep your top tucked in so you didn't need to worry about it. The one I had did up with snaps at the crotch and that could be a bit of challenge to do up. I think I was about 10 when I wore it and maybe my coordination wasn't the best:) My favourite is the peasant tops. I know they are back and I loved them then and I still love them now. Thanks for taking me back in time. My preference for sizing would be adult since my kids are too old now. I personally like 9723 - I think those would all be cute again in the right fabric. 5023 is hilarious. I LOVE LOVE 9723... I think that would so rock in the right fabric and color choices .. also I think if 5023 was done correctly that would back so old school styles and I am sure people would wear them!!!! I love old mod type stuff with simple lines, and the big skirts and primness of little girl's dresses from the 50's. What totally gets me are those huge freaking ruffle sleeves that were on every single dress I wore as a kid. Heck I could almost take flight in one of those things! The ladies patterns are so fun and funny to look at. Especially, because they are all coming back in. But I would love any in children sizes. I love making the little jumpers and dresses for my girls. Thanks for sharing the fun. ooh i have 6676, picked it up at a vendors mall in a Huge box of vintage patterns. I use them but leave off some collars and such, use more modern fabrics.. stuff like that. I love 6676. I think with the right fabric you could make it look really hot, mama hot, maybe? I hate the poofy sleeves/shoulders of the early 80's. My grammy made me tons of dresses and so many of them have those big poofy sleeves/shoulders, blech! My favorite patterns are from the 1940's. The waist line and the full skirt, dreamy. I love the vintage housewife dresses! Fitted bodice, full skirt, beautiful! No wonder those women on TV were so happy all the time, they looked amazing! I absolutely LOVE the vintage hippy look. I was born in the wrong era, lol. Peasant tops, maxi dresses and skirts and tunics are a staple in my wardrobe. I have been canvassing my mom and grandma for their old sewing patterns, for me and my kids. I am also a huge fan of the the bathing suit pattern you have, since my 12 year old isn't old enough for most styles available for her size, and too old for the some. Those pointy collars baffle me, too...did they really like the look? !I love full skirted, fitted top 50's dresses and 60's a-lines. It is a toss up between body suits & one piece jumpers for women. I think I love rompers the most. So adorable and so chic all at once. Thanks! Big sunglasses, big floppy hats and big bell bottomed pants!!! LOVE THE VINTAGE PATTERNS! Big huge swing skirts with petticoats! That one isn't so much a crack-me-up as a love, though imagining someone in one of those things navigating their way through the narrow benches at my work makes me giggle a little. I am totally digging the bathing suit, blouse and pants! It's groovy! I think the jump suit is hilarious. I kind of like the long skirts they look a lot like the maxi dresses that are really big right now. I like the children's patterns you have!Thanks for the giveaway! The 8744 pattern is awesome. I think it is a classic look, no matter the era. Some platforms, floppy sun hat and big shades... perfect for a day out! I love the clothes from the 1960's, but the skirts/dresses are far too short for me to wear!